Commonly referred to as the Spike Speedwell, this is one of the more popular Veronicas. 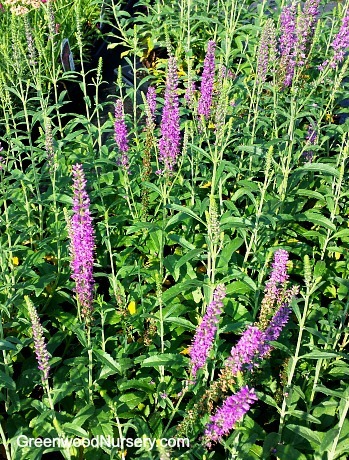 The tightly packed variety from the Veronica Moody Blues™ series features bright spikes of deep blue perennial flowers that grow in conical form atop long stems. These are normally in bloom from spring to fall until winters’ first frost. The Dark Blue Moody Blues are most prolific in well drained and richly organic soils. They should be planted in full sun although they have proven to be tolerant to a wide range of varying conditions. Water them before planting in a hole that is twice as wide as the pot. After backfilling, plant it 1-2 inches above soil level adding more soil as needed. You may need to mulch the plants using organic matter every year in spring or in hotter climates. The Spike Speedwell grows up to be 12-14 inches tall and 12-14 inches wide. They are an excellent choice to add accents of varying height and textures to your garden. Plant them in masses to reap the full benefits of their brilliant hue. They can also be mixed with shrub roses and flowering perennials for variety of color and blooms. Their compact shape makes them perfect for planting in containers, pot or baskets. This hardy plant requires little maintenance once established and can survive very low temperatures of zone 4. It has a medium growth rate and does not need much pruning, deadheading will promote new growth. It also has little watering needs, as long as the soil is well moistened. This Veronica attracts bees, butterflies and hummingbirds, but is deer and rabbit resistant. It can be used as border plant, for edging or even as an accent plant in your garden. You can buy Veronica plants online here at GreenwoodNursery.com. Orders shipping to CA or AZ may be bare rooted before being prepped for shipping.